It has an area of 424.58 square kilometers (163.93 sq mi) and had a population of 1,905,000 at the time of the 2010 Chinese census. 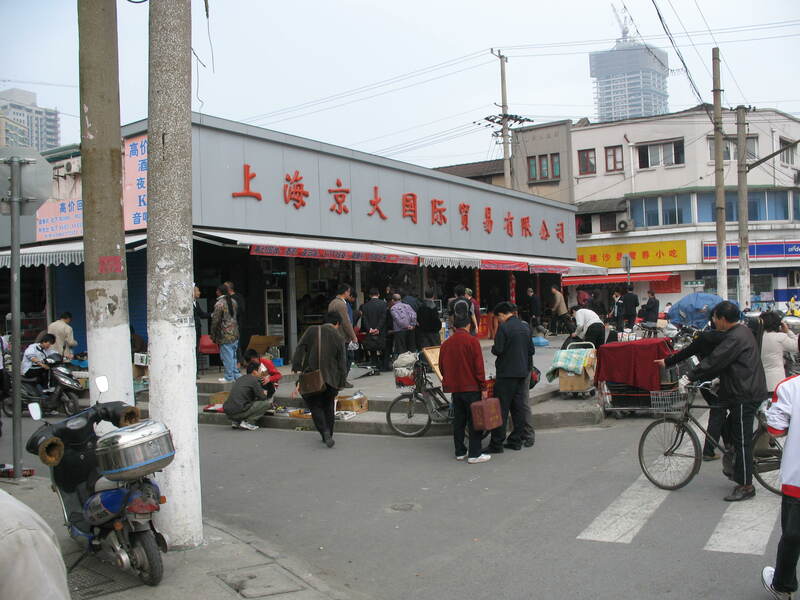 The area was the scene of heavy fighting during the Battle of Shanghai. 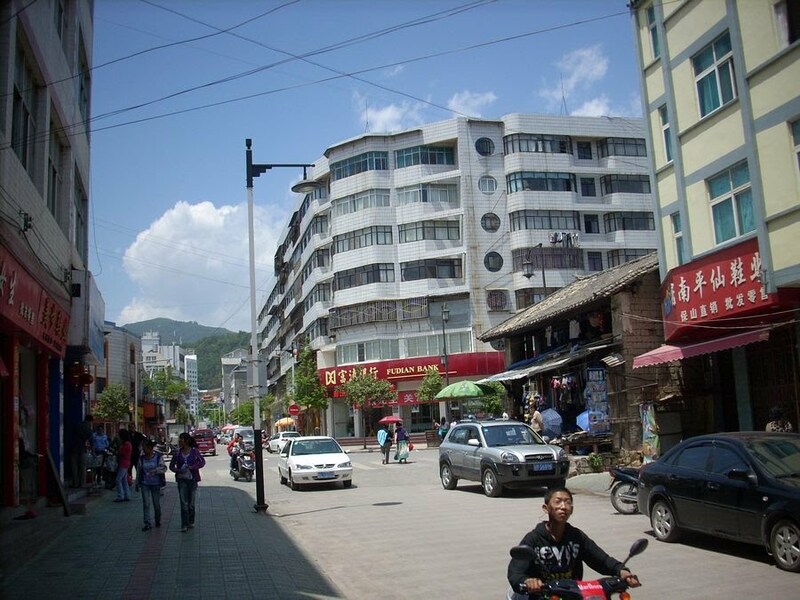 As of 2015, many economic migrants from Chongming Island had moved to Baoshan District. The district is home to Baoshan Steel's original factory, still a major producer of iron and steel. Rovio Entertainment has its China offices in Baoshan District. The Shidongkou Power Station (石洞口发电厂) is located along the Yangtze. In the vicinity of Baoshan, Shanghai International Cruise Terminal, and Wusong International Cruise Terminal are located. The first one serves mostly to small cruise ships, however, the second is one of the world's most developed passenger terminals. The port provides free shuttles. Although, you can take a taxi from the terminal and get to your destination point, or to the nearest road station, railway station, or subway. Baoshan District is served by the Shanghai Metro. There are 3 lines from Baoshan to central Shanghai—Line 1, Line 3, and Line 7—which operate as subways, elevated rail, and light rail in different parts of the district. Line 7 - Meilan Lake, Luonan Xincun, Panguang Road, Liuhang, Gucun Park, Qihua Road, Shanghai University, Nanchen Road, Shangda Road, Changzhong Road, Dachang Town, Xingzhi Road, Dahuasan Road. The 952B bus runs from Youyizhi Rd at Youyi Rd toPeople's Square in central Shanghai. The #5 tourist bus runs from Mudanjiang Rd to Jiangwan Town Station.Ferries to Chongming Island operate from Wusong, Baoyang Rd, and Shidongkou. Ferries to Putuoshan are also available. The Anti-Japanese War Memorial Park on Donglin Lu has a small museum with artifacts from the Second World War and a modern glass-and-steel pagoda. Visit Shanghai. Click the link to see the main attractions. Shanghai's cuisine, like its people and culture, is primarily a fusion of the forms of the surrounding Jiangnan region, with influences sprinkled in more recently from the farther reaches of China and elsewhere. Characterized by some as sweet and oily, the method of preparation used in Shanghai, it emphasizes freshness and balance, with particular attention to the richness that sweet and sour characteristics can often bring to dishes that are otherwise generally savory. Shanghai local cuisine or Shanghainese food is also known as Shanghainese cuisine, and authentic Shanghai cuisine, mainly features freshness, especially the fresh fish and shrimps, bright colors, and original flavors. Boiled eel(锅烧河鳗), three yellow chicken(三黄鸡), fried shrimp (油爆河虾), Shanghai drunk crab(上海醉蟹), etc. are the typical local cuisine. The name "Shanghai" means "above the sea," but paradoxically, the local preference for fish often tends toward the freshwater variety due to the city's location at the mouth of China's longest river. Seafood, nonetheless, retains great popularity and is often braised (fish), steamed (fish and shellfish), or stir-fried (shellfish). Watch out for any seafood that is fried, as these dishes rely far less on freshness and are often the remains of weeks' old purchases. Shanghai's preference for meat is unquestionably pork. Pork is ubiquitous in the style of Chinese cooking, and in general, if a mention refers to something as "meat" (肉) without any modifiers, the safe assumption is that it is pork. Minced pork is used for dumpling and bun fillings, whereas strips and slices of pork are promulgated in a variety of soups and stir-fries. The old standby of Shanghainese cooking is "red-cooked [braised/stewed] pork" (红烧肉), a traditional dish throughout Southern China with the added flair of anise and sweetness provided by the chefs of Shanghai. Chicken takes the honorable mention in the meat category, and the only way to savor chicken in the Chinese way is to eat it whole (as opposed to smaller pieces in a stir-fry). Shanghai's chickens were once organic and grass-fed, yielding smaller birds offering more tender and flavourful meat than its hormone-injected Western counterparts. Unfortunately, these hormones have found their way to China, and today most chickens are little different from what can be found elsewhere. Still, the unforgettable preparations (drunken, salt-water, plain-boiled with dipping sauce, etc.) of whole chickens chopped up and brought to the table will serve as a reminder that while the industrialization of agriculture has arrived from the West, the preservation of flavor is still an essential element of the local cooking. Those looking for less cholesterol-laden options need not fret. 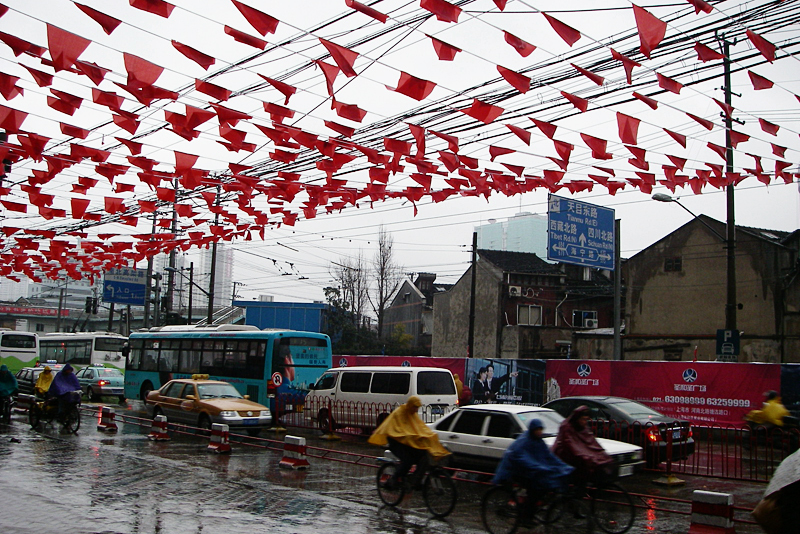 Shanghai lies at the heart of a region of China that produces and consumes a disproportionately large amount of soy. Thinking tofu? There's the stinky version that when deep-fried, permeates entire blocks with its earthy, often offensive aroma. Of course, there are also tofu skins, soy milk (both sweet and savory), firm tofu, soft tofu, tofu custard (generally sweet and served from a road-side cart), dried tofu, oiled tofu and every kind of tofu imaginable with the exception of tofurkey. There's also vegetarian duck, vegetarian chicken and vegetarian goose, each of which looks and tastes nothing like the fowl after which it is named but is rather just a soy-dish where the bean curd is expected to approximate the meat's texture. Look out also for gluten-based foods at vegetarian restaurants, which unlike tofu, do not come with the phytoestrogens that have recently made soy controversial in some countries. If you are vegetarian, do be conscious that tofu in China is often regarded not as a substitute for meat (except by the vegetarian Buddhist monks) but rather as an accompaniment to it. As such, take extra care to ensure that your dish isn't served with peas and shrimp or stuffed with minced pork before you order it. xiǎo lóng bāo (小笼包, lit. buns from the little steaming cage; fig. steamed dumpling). Probably the most famous Shanghai dish: small steamed buns - often confused for dumplings - come full of tasty (and boiling!) broth inside with a dab of meat to boot. The connoisseur bites a little hole into them first, sips the broth, then dips them in dark vinegar (醋 cù ) to season the meat inside. Of special mention is Din Tai Feng, an ever-popular Taiwanese restaurant boasting its designation as one of The New York Times 10 best restaurants in the world, with a handful of locations in Puxi and one in Pudong. shēng jiān bāo (生煎包, lit. freshly grilled buns). Unlike steamed dumplings, these larger buns come with dough from raised flour, are pan-fried until the bottoms reach a deliciously crispy brown, and have not made their way to Chinese menus around the world (or even around China). Still popular with Shanghainese for breakfast and best accompanied by vinegar, eat these with particular care, as the broth inside will squirt out just as easily as their steamed cousins. Shàng hǎi máo xiè (上海毛蟹; Shanghai hairy crab). Best eaten in the winter months (Oct-Dec) and paired with Shaoxing wine to balance out your yin and yang. xiè fěn shī zi tóu (蟹粉狮子头; lit. crab meat pork meatballs). Yang's Dumpling, 88号 Huanghe Rd, Huangpu District. One of the best places to try the local bun specialties. Their menu is in English as well as Chinese, ironically except for the famous buns which are listed on the left of the menu in Chinese only. They're 4 for ¥6 and after ordering them you take a slip up to the counter across from the register and someone will give them to you scalding hot. All other things will be brought to your table. 南翔馒头店 著名小笼包专卖店, Yuyuan Bazaar. 南翔馒头店 著名小笼包专卖店 （Nán xiáng mántou diàn zhùmíng xiǎo lóng bāo zhuānmài diàn） is a dumpling take-out window in the Yuyuan Bazaar which apparently serves food regardless of the customer’s dietary needs (you are warned! ), so if you are delicate, to avoid. The traditional alcoholic drink of choice for the Shanghainese is Shaoxin rice wine, and this can still be found in most restaurants. Western-style cafés and bars have also become commonplace. Prices of drinks in cafés and bars vary like they would any major metropolis. They can be cheap or be real budget-busters, with a basic coffee or beer costing ¥10-40. In a high-end hotel bar, one basic beer may cost as much as ¥80. There are internationally-known chains, like Starbucks and Coffee Bean & Tea Leaf, as well as popular domestic and local java joints to satisfy those looking to relax. Hong Kong-style tea cafes are also common, as are Asian "pearl milk tea" or "bubble tea" bars. Some traditional tea houses can still be found, especially in the Old City. Tsingtao, Snow and Pearl River beer are widely available. Major foreign brands are produced domestically, and smaller brands are typically imported. There is also a local brew known as REEB (beer spelled backward). A large bottle (640 ml) of any of these costs anywhere from ¥2-6. Shanghai is filled with amazing nightlife, complete with both affordable bars and nightclubs that pulsate with city energy. There are many magazines for expats that can be found at hotels and other expat eateries that list and review events, bars, clubs, and restaurants in Shanghai. The most popular ones are That's Shanghai, City Weekend, and Time Out. Shanghai also has an English newspaper, Shanghai Daily, and an English-medium TV channel, International Channel Shanghai or ICS; most expats find these better than the corresponding national media outlets, People's Daily and CCTV channel 9. Much of the shopping in Shanghai is either downtown or (mostly for big malls) across the river in Pudong; see links for details. This section covers only a few types of shopping that are found all over the city. If you're after a new cellphone, go to the Shanghai Railway Station. You can find good deals on secondhand phones as well as new phones (the selection is a mixed bag; you'll find Chinese off-brands mixed with reliable big-name brands as well as cutting-edge Japanese phones; if you live in North or South America be careful about buying the off-brand phones as most do not support the necessary frequencies for use there. Also, in the secondhand section of the market, some of the phones are of dubious origin; CDMA phones may have their ESNs blacklisted in their home countries, but for GSM/3G phones the only issue is an ethical one. Be careful about prices that are too good to be true. Also, for small discounts at various restaurants and hotels as well as 50% off tickets to certain attractions (Shanghai World Financial Center observation deck, Happy Valley, Science, and Technology Museum, among others) try to find a branch of Woori Bank to sign up for the Shanghai Tourist Card. All Chinese banks issue this as a credit card, preventing non-Chinese visitors from signing up by virtue of requiring proof of income in China, but Woori is a Korean bank and caters to Koreans (including Korean tourists), and thus offers it as a debit card, allowing anyone to sign up for it with just a passport. Sign-up (including account creation) takes approximately half an hour, and the card is immediately issued upon account creation. Branches are located near Metro Line 2 Century Ave. station (address is 1600 Century Ave. Pos-Plaza 1-2F) and Metro Line 9 Hechuan Rd. station (address is 188 South Huijin Rd: ask for directions to Bank of China; once you get there, turn right and keep walking until you see it). However, a hotel address may not be acceptable, and there may be a handling fee for accounts canceled within a month of opening. An incidental advantage of the Woori Bank Shanghai Tourist Card is that the account allows unlimited free withdrawals at any ATM in China. Thus it will be more convenient to put all your money on the card and withdraw from ATMs only as necessary. If planning to visit two or more of the attractions that half-price tickets are offered for, the time spent is well worth the discount (maximum two discounted tickets purchased per card, offer lasts until the end of World Expo). Also, Travelex offers a Shanghai Tourist Card Cash Passport IN JAPAN ONLY. If transiting through there, getting the Cash Passport version is easier and quicker, and offers all the benefits of the Woori Bank version except for free ATM withdrawals. In Hong Kong, AEON Credit offers the Shanghai Travel Prepaid card instead. Same as the Travelex card except initial currency is Hong Kong dollars, and a 1.1% fee is charged during the Hong Kong dollar->yuan conversion process. Violent crime remains rare, and it is safe for even women at night. There is some scam, such as teahouse scam, and petty crimes can happen especially at the transportation hub and crowded area. It is very common for curious Chinese to genuinely start a conversation with you, show you around, invite you for a drink and a meal. If you are paranoid about all invitations and interactions with the Chinese, it will ruin your travel experience. If you feel suspicious about the place you are invited to go, choose your place such as McDonald's, Starbucks, KFC. If they are persistent at going to their "place" and make endless excuses to turn down your suggestions, use your common sense to tell if it's a scam. In a genuine tea shop, tea sampling is always for free. They just want you to taste and buy the tea leaves. If you have to pay, you will know it beforehand. In a teahouse, it is unusual if they serve you any premium tea without your knowledge. Remember that you are Laowai, a foreigner, you should not feel embarrassed to ask about the price. If you are asked to foot the bill at a ridiculous amount (more than Y500) without your prior knowledge, you know it's a scam. Don’t pay. Call 110 and report the scam. If you are forced to pay, ask for a "fapiao" (发票), an official sales invoice issued by the taxation department. It is against the law for an owner to refuse to give it to you. If you have the receipt, you can use it as evidence when making a report later. You should also pay by a credit card because it is possible to cancel the payment later. There are no widely enforced health regulations in restaurants. Restaurants prepare hot food when you order. Even in the smallest of restaurants, hot dishes are usually freshly prepared, instead of reheated, and rarely cause health problems. Most of the major cities have chain fast food places, and the hygiene in them tends to be good. Use common sense when buying food from street vendors. This is especially true for meat or seafood products; they can be very unsafe, particularly during warm weather, as many vendors don't have refrigeration. A rule of thumb regarding street food is to make certain it is cooked thoroughly while you are watching; also, visit stalls frequented by locals, and look for plastic-wrapped disposable chopsticks. Minor stomach discomfort may still be experienced from street food and restaurant food alike but is said to pass as one becomes accustomed to the local food. Ginger is effective against nausea, though it does not kill bacteria. Even in the cities, Chinese people do not drink water straight from the tap, and you should not either. All hotels (even boats!) provide either a thermos flask of boiled water in your room (refillable by your floor attendant) or - more commonly - a kettle you can use to do it yourself. Tap water is safe to drink after boiling. Purified drinking water in bottles is available everywhere and is quite cheap. Beer, wine, and soft drinks are also cheap and safe. Many drugs are available from a pharmacist without a prescription. You can usually ask to see the instructions that came with the box. Western medicine is called xīyào (西药). However, some drugs which are commonly used elsewhere do require a prescription, such as dextromethorphan, which is widely used as a cough suppressant in Western countries. The official language of China is Standard Mandarin, which is mostly based on the Beijing dialect, known in Chinese as Putonghua. For the last twenty years, Chinese students have been taught English as a compulsory subject starting from late elementary or middle school. Passing an English exam is a requirement to earn a four-year university degree, regardless of major. However, the focus of the instruction at all levels is formal grammar and, to a lesser degree, writing rather than speaking or listening. Shanghai, Beijing, Guangzhou, and Shenzhen do have a higher proportion of English-speaking locals. In certain cities, outside major tourist attractions and establishments catering specifically to foreigners, it is rare to find locals conversant in English. Airline staff and those at large hotels - particularly international chains - usually speak some basic to conversational English, although in-depth skills are seldom seen. When speaking, as anywhere English language skills are limited, it is helpful to simplify your English. Speak slowly, avoid slang and idioms, and use simple present tense declarative sentence structure. Don't say "Would you mind if I come back tomorrow? ", stick to simpler, more abrupt phrasing like "Tomorrow I will return." This brings the phrase closer to its Chinese equivalent and is therefore not necessarily condescending. One way to meet people is to ask about "English Corner" - a time and place in town where locals, often with a foreign host or speaker, meet to practice spoken English. Typically, they are held on Friday evenings or Sundays in public parks, English training schools, bookstores, and university campuses. There may also be "Corners" for French, German, Russian and perhaps other languages. You may want to consider arranging the services of a tour guide before your trip commences if you wish to go too far-flung areas. This will help you overcome the language barrier where locals in those places will unlikely know any foreign language, let alone English. However, due to lasting effects of the Sino-Soviet friendship treaty, in rural regions, particularly in the north-west, Russian, is a commonly encountered language. It is advisable to have all places you want to visit written down in Chinese characters, also bunch frequent words - you know them from previous trips (even words like a hotel, taxi or airport are unknown). An easy way to explain your need to locals is to have Baidu Fanyi (zh-cn: 百度翻译) app installed. It will translate English and some other languages from and to Chinese. Look for 英语 (English) and click on and set your destination language to 中文 (Chinese). See the Highlights of Shanghai City in this Half Day Tour! See the Highlights of Shanghai in a Customized, Private Tour!